The Toronto Maple Leafs have signed diminutive forward Mark Arcobello to a 1-year, $1.1 million contract. Arcobello, who turns 27 next month, is a 5’9 right handed center. 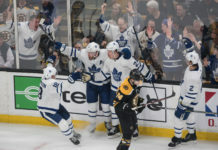 The Leafs are his fifth team since 2014 and he has never played more than 41 NHL games in a season, but he has produced at an NHL-capable level with 49 points in 119 career NHL games. He has a career 51.3CF% and 1.7 CF rel %, as he is a high volume shooter and brings some speed to the line-up. Originally an undrafted pickup by the Oilers out of college, Arcobello was an RFA who went unqualified by Arizona despite posting nine goals and 16 points in 27 games. It follows the theme of the day, along with the Matt Hunwick and P.A. Parenteau adds – cheap flyers on players with good possession numbers. With Kyle Dubas noting that the Leafs are going to move Nick Spaling back to center, Arcobello could join a center group that currently looks like this: Kadri, Bozak, Holland, Spaling, Arcobello, Carrick. All of Spaling, Arcobello and Carrick can play wing, plus it remains to be seen what will happen with Tyler Bozak and even RFA Nazem Kadri.